Hey, guys. Remember that viral YouTube video “Charlie bit my finger”? It made the rounds online a few years ago and those adorable brothers became instant internet sensations. Harry, the older brother placed his finger in Charlie’s mouth, and then…well, just click the darn link and see for yourself. Now, can we utilize the video for some language learning lessons? Let me ask you a language question: how does one go from being a Charlie, the baby brother on the left, to being a Harry? In other words, how does one go from being a total newb, whose linguistic skills end with smiling and biting, to being a fluent speaker whose English is marked by appropriate diction, golden grammar and a killer accent? Normal, everyday children make this amazing progress in the span of about 20 months. This brings us to the question, which is also the title of this post: How do children learn language? And what lessons can foreign language learners get from these precious children? We’ll deal with those great questions in this post. First, we’re going to trace a baby’s journey from babbling newborn to kindergartner. Along the way, we’ll note the milestones of language development along the way. In part two of the post, we’ll crystallize the lessons from part one and use them to help adults learn a foreign language. How do children do it? Let’s look at the issue in finer detail. We used to think that language learning began at the moment of birth. But scientists in Washington, Stockholm and Helsinki discovered that fetuses are actually listening inside the womb. They gave mothers a recording of made-up words to play during the final weeks of pregnancy. The babies heard the pseudo-words around 50-71 times while inside their mother’s womb. After they were born, these babies were tested. By hooking them up to an EEG, scientists were able to see images of the babies’ brains when the made-up words were played. To their astonishment, the babies remembered and recognized the words that were presented when they were in the womb. You know what this suggests, right? It points to pre-natal language learning. It turns out, the first day of learning language isn’t when one is born, but 30 weeks into the pregnancy when babies start to develop their hearing ability. So be careful what you say around a pregnant woman, ok? Somebody’s listening. Newborn babies are keen listeners in their environments. They particularly like to listen to the voice of their mother and they quickly differentiate it from other voices. They also learn to recognize the sounds of her language from a foreign one. Baby communication centers on expressing pain and pleasure. And if you listen very carefully, you’ll notice that babies have different types of cries for different needs. A cry for milk is different from a cry for a new diaper—although a flustered first-time father might not hear any difference. This is the peek-a-boo stage. Babies pay attention and smile when you call them by name. At this stage, babies continue babbling and having fun with language. But this time, their unintelligible expressions have put on a certain kind of sophistication. They seem to be putting words together. You could’ve sworn she was telling you something. It will actually be around this time when babies learn their first words (“no,” “mama,” “dada” and so on). And on her first birthday, she’ll definitely learn what the word “cake” means. This is the “Where’s-Your-Nose?” stage. This is also the time when she loves hearing those sing-along songs and rhymes. And guess what? She’ll never tire of these, so be prepared to listen to her favorite rhymes over and over and over again. There will be a tremendous increase in learned words at this stage. She now seems to have a name for everything—from the cups she uses to her shoes and toys. She gains more nouns, verbs and adjectives in her linguistic arsenal. By this time, you’ll begin to suspect that she’s preparing to ask ever more difficult questions. The child has learned the language and has become a native speaker. We’ve just gone over how babies progress to acquire their first language. Is there something in this process that adult language learners can emulate in their quest to learn foreign languages? Well, as it turns out, there is. Understanding this early childhood learning process has major implications for adult language learners. In this part of the post, we’re going to peek behind the curtain and look even deeper into how children learn languages to reap 4 vital lessons. Each one of these lessons is an essential part of linguistic success. If you wanna know how babies go from “goo-goo gaa-gaa” to “Mom, will you please buy me this remote-controlled toy airplane?” then please read on. We’ve learned in the previous section that listening comes very early in the language acquisition process. Babies get a masterclass on the different tones, rhythms and sounds of a language even before they see the light of day. Without listening, they’d have no building blocks from which they can build their own repertoire of sounds. Listening is so important for language acquisition that babies don’t fully develop their language capabilities without the ability to hear. Thus we have the deaf-mute pairing. How can one learn to speak when one can’t even hear others or oneself doing it? In addition, children who suffer hearing problems early in life experience delays in their expressive and receptive communication skills. Their vocabulary develops slower and they often have difficulty understanding abstract words (eg. extreme, eager and pointless). Their sentences are also shorter and simpler. In general, the greater the hearing loss, the poorer the children do in academic evaluations. Listening is that central to language. It’s the first language skill humans develop. And yet, how many language programs pound on the issue of listening as a central skill, as opposed to grammar or vocabulary? Listening is a deceptive, isn’t it? It seems like nothing’s happening. It’s too passive an activity, unlike speaking. When speaking you actually hear what was learned. The benefits of listening are initially unheard. Contrary to common belief, listening can be an intensely active activity. So as a foreign language learner, you need to devote time to actively listen to your target language. Don’t just play those podcasts passively in the background. Actively engage in the material. Don’t multitask if at all possible. Sit down and don’t move—like a baby who hasn’t learned how to walk. Take every opportunity to listen to the language as spoken by native speakers. When you watch a movie or a language learning video, for example, don’t just focus on the visual stimulation. Listen for the inflections, tones and rhythms of words. It may not look like much but, yes, listening is that powerful. Listening to a 1-year-old talk is such a delight. They’re so cute and innocent. Their initial statements betray a string of misappropriated vocabulary, fuzzy logic and grammar violations. We aren’t as kind to adults. We’re even worse to ourselves. Ever since we learned in school that making mistakes means lower test scores, we dreaded making them. Mistakes? Bad. And we carry over this fear when we’re learning a foreign language as adults. That’s why, unless we’re 100% sure of its correctness, we don’t want to blurt out a single sentence in our target language. First we make sure that the words are in their proper order, the verbs are in the proper tense and agree with the subject in number and gender. Now something tells me that a 10-month-old has no problems committing more mistakes in one sentence than she has words. In fact, she probably won’t admit that there’s something wrong—or ever know that something’s wrong. She just goes on with her life and continues listening. Why don’t we follow this spirit of a child? We already know that it works because the kid who once exclaimed, “my feets hurt,” is now galloping towards a degree in Sociology. As a foreign language learner, one of the things you need to make peace with is the fact that you’re gonna make mistakes. It comes with the territory and you’re gonna have to accept that. Make as many mistakes as you can. Make a fool out of yourself, like a 2-year-old, and laugh along the way. Pay your dues. And if you’re as diligent correcting those mistakes as you are making them, soon enough you’ll be on your way to fluency. Around 6-12 months, playing peek-a-boo with your daughter never gets old. She always registers genuine surprise every time you reveal yourself. And she’d laugh silly all day—all because of a very simple game. And remember around 1-2 years old when babies can’t get enough of those sing-songy rhymes? They wanted you to keep pressing the “replay” button while watching their favorite cartoon musical on YouTube. You were wondering when they were gonna get sick of it. But lo and behold, each time was like the first time. They weren’t getting sick of it. In fact, it was getting more exciting for them. Repetition. It’s a vital element of learning. If there’s one reason why babies learn so fast, it’s because they learn stuff over and over—to the point of overlearning. Adults never have the patience to overlearn a language lesson, to repeat the same lesson over and over without feeling bored to tears. Adults quickly interpret this as being “stuck.” This lack of forward motion is promptly followed by the thought that time is being wasted. They think they should press quickly on to the next lesson. Which they do, to the detriment of their learning. We repeat a vocabulary word 3x and expect it to stay with us for life—believing it will now be saved in our long-term memory. Quite unrealistic isn’t it? Repetition is vital to learning. In fact, many apps take the concept further and introduce the idea of Spaced Repetition. To find out more about this hyper-effective learning method, click here. Unless you’re a genius with an eidetic memory, repetition will be one of your most important allies in the quest for foreign language mastery. Repetition can take the form of replaying videos, rereading words, rewriting vocabulary, re-listening to podcasts and re-doing games and exercises. Keep on repeating until it becomes a habit. Because that’s what a language ultimately is. Immersion can actually push your brain to process information in the same way native speakers do. And is there anything more immersive than a baby being born and experiencing the world by observation? Think about what the baby is experiencing. She’s like an Englishman suddenly being dropped in the middle of China without access to the internet. So you use your innate abilities to make generalizations, read context, listen to native speakers and imitate how they speak. There’s nothing fake about a child learning a language. It’s a total immersive and authentic experiences—all their early language lessons are learned in a meaningful social context. 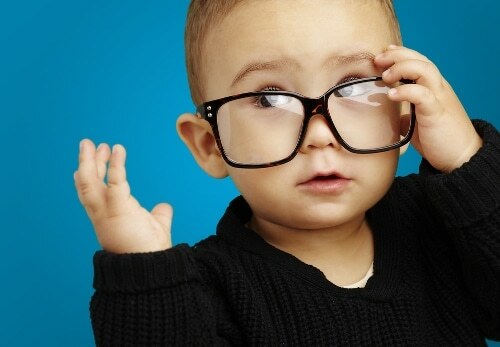 I have yet to meet a baby who learned his first language by enrolling in a class. For the adult language learner, immersion can be experienced remotely. One way of achieving immersion is by getting exposed to as many language learning videos as possible. 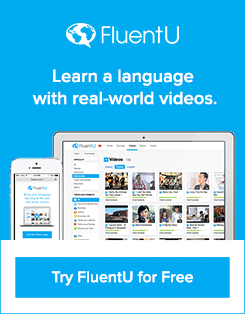 FluentU is, by far, the best source of language learning videos on the internet. You’ll get a chance to watch authentic video content that native speakers actually watch on the regular, like trailers for “The Hunger Games,” vintage Volkswagen commercials, hot music videos, funny YouTube clips and much, much more. FluentU can make different learning experiences and contexts come alive so you don’t have to fly to a country thousands of miles away just to get the immersion that’s necessary for language learning. It’s not just about listening and watching either, FluentU’s learn mode will help you put new language lessons into practice with great tools like multimedia flashcards, interactive subtitles and running vocabulary lists. Who knew a little girl could teach us so much about learning a foreign language? Now it’s officially time to put these lessons into practice: (1) Listen, (2) don’t be afraid to make mistakes, (3) repeat everything and (4) immerse yourself in your target language. Whether it’s French, Spanish, Japanese, Korean or Russian, if you follow the path that the babies have laid out for you, you’ll be speaking that target language like the natives in no time!